Home/People and Sound/Investigate Marine Animals/How is acoustics used to monitor Arctic marine mammals? This animation tracks the relative amount of ice of different ages from 1990 through early November 2016. Seasonal ice is darkest blue. Ice that is 9 or more years old is white. Video produced by the Climate.gov team, based on NOAA and NASA data provided by Mark Tschudi, University of Colorado-Boulder. Data processing by Hunter Allen. Editing by Bruce Sales. Narration by Deke Arndt, NCEI. Warming in the Arctic is occurring at a much faster rate than the global mean. Sea ice loss will have direct and indirect impacts on many Arctic species, including marine mammals. Many of these species are especially vulnerable to climate change due to their close association with, and in some cases dependence on, sea ice (for reproduction, resting, and feeding). Changing Arctic climate conditions are also impacting species distributions and migration patterns. Subarctic species, such as gray, humpback, and fin whales, may expand their range into Arctic waters during extended, ice-free months, increasing competition for resources with other Arctic species. The reduction in Arctic sea ice also provides humans with unprecedented access to the region. Extended ice-free periods have stimulated plans for shipping, oil and gas development, tourism, commercial fishing, and other offshore activities. Given the potential rise in human activities, there is growing concern regarding the potential effects of anthropogenic noise on marine mammals. Marine mammal vulnerability to anthropogenic sound in the Arctic needs to be characterized. Maps of marine mammal movement patterns and habitat use are central to this effort. However, abundance estimates, habitat assessments, migration patterns, and other key, baseline data are limited or undescribed for many Arctic marine mammals. Also, the effects of noise will vary dramatically between regions, and species-specific responses to climate change are not likely to be consistent. Assessing the status and trends of marine mammal populations in the Arctic is difficult, though, due to species’ distributions, cryptic behaviors, seasonal movements, and the logistical challenges of surveying in remote environments. Passive acoustic monitoring (PAM) is a versatile, non-invasive, and cost-effective method to detect, classify, and track marine mammals over large areas for long periods. Acoustic recorders can be mounted to fixed moorings, floats, gliders, and autonomous underwater vehicles (AUVs). Passive acoustics has greatly increased the detection of marine mammals in the Arctic when compared with previous visual observations. It has been used since the 1980s to monitor the migration of the Bering-Chukchi-Beafort (BCB) population of bowhead whales in the western Arctic. Since 2008, over 100 recorders have been deployed. 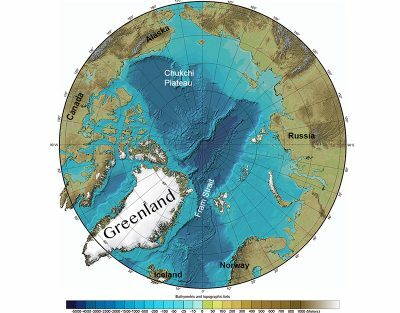 This strong sampling effort is associated with oil and gas exploration in the northeast Chukchi and western Beaufort Seas. Bowhead whale moans recorded in the Arctic Ocean, off Point Barrow, Alaska. Sound ©North Slope Borough, Barrow, Alaska. Another study determining fin whale presence in the southern Chukchi Sea via passive acoustics found fin whales to remain longer in the area than previously reported. The whales remained in the area until there was a decrease in water temperature and sea ice formed. Thus, if Arctic sea ice losses continue to extend in time and geographic space, with associated increases in water temperature, scientists believe the range of fin whales into the Arctic will also expand. 20 Hz pulses from fin whales recorded by SOSUS receivers in the eastern North Atlantic. To make this sound audible for humans, it was sped up by a factor of ten. This raises the pitch and compresses the time. Sound © Cornell Laboratory of Ornithology, Bioacoustics Research Program. 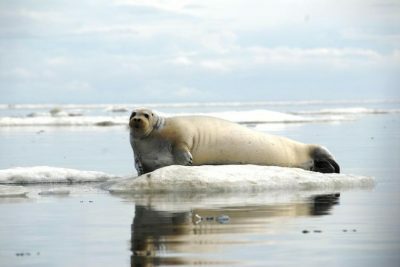 During most of the year, bearded seals are found on Arctic pack ice in shallow water (less than 100m) to maintain proximity to preferred benthic prey (mollusks and crustaceans). Acoustic monitoring has shown losses in ice cover may negatively impact bearded seals, through loss of reproductive and foraging habitat. Image credit: NOAA. Autonmous acoustic recorders and hydrophones deployed from small boats have provided data on the acoustic repertoire of several Arctic pinniped species, including ribbon, ringed, and bearded seals. Multiple studies have investigated the movement patterns, sea ice interactions, and reproductive strategies of bearded seals. Male bearded seals are highly vocal during the breeding season, producing elaborate, underwater “trill” vocalizations. These sounds travel long distances and can be used to provide at-sea locations for vocalizing males. Calling activity is significantly correlated with higher sea ice concentrations. This suggests that losses in ice cover may negatively impact bearded seals, which depend on sea ice habitats for breeding, resting, and foraging. Vocalization of bearded seal. From Ocean Voices of the Alaskan Arctic. Produced by Christopher W. Clark. Cornell Laboratory of Ornitology, 1991. Department of Wildlife Management, North Slope Borough, P.O. Box 69, Barrow, Alaska 99723, USA or Cornell Laboratory of Ornithology, 159 Sapsucker Woods Road, Ithaca, New York 14850, USA. Arctic map showing locations of the Fram Strait and Chukchi Plateau (white text), as well as other major landmarks (black text). Adapted from a NOAA NGDC map. Passive acoustics is also a valuable tool for long-term monitoring. Acoustic recorders were simultaneously deployed in the Fram Strait (the passage between Greenland and Svalbard, Norway) and on the Chukchi Plateau (a large subsea formation extending north from Alaska into the Arctic), representing the first coordinated, year-round sampling of underwater acoustic habitats at two sites in the High Arctic. The collected data provide a baseline to which other Arctic sites can be compared, and showed distinctly different acoustic habitats at each site. The Fram Strait site was more acoustically complex, with calls from bowhead whales and toothed whales (belugas and narwhals), as well as airgun pulses, recorded year-round. Calls from blue whales and fin whales were also recorded. At the Chukchi Plateau, beluga and bowhead whales, ribbon seals, and airgun pulses were detected seasonally. No marine mammal calls were recorded at all from December through February. Bearded seal calls were recorded at both sites during spring and summer, corresponding with the mating season for the species. Scientists attributed the differences in soundscapes to differences in sea ice cover, temperature, patterns of ocean circulation, and anthropogenic noise sources. The year-round detection of bowhead whales in the Fraim Strait suggest that this area is an overwintering ground, and potentially a mating area, for this endangered population of baleen whales. It is important to note that these studies have been conducted on distinct populations, and a wider understanding of Arctic marine mammal spatial and temporal distributions is still needed. PAM studies are also limited in that they rely on vocally active marine mammals and the knowledge of vocal rates of a particular species. PAM data, however, are still critical in developing an understanding of the Arctic ecosystem, from which future changes in ambient noise can be monitored, and potential impacts on Arctic marine mammals investigated and understood. Integrating passive acoustic systems into ocean observing initiatives will also provide a means to track changes in the underwater acoustic environment. A hydrophone has been incorporated into the underwater sensor platform maintained by Ocean Networks Canada’s Cambridge Bay Observatory. Science of Sound: How does sea ice affect how sound travels?